Photos by MJ Klein Food Photos! I lit a fire, put on some food and the guests started arriving. 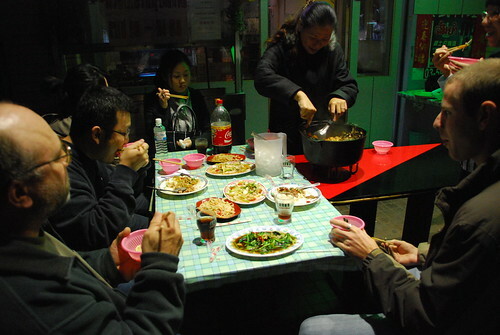 Yup, it was another party at Shao-hui’s. Do we ever get tired of them? No way! After the fire was lit, I put the food on. I cooked US beef calf muscles (2 packs) with the usual stew vegetables, a ton of garlic, cilantro and basil. Top coals are a very important aspect so as you can see, I have a second fire going. While I’m browning the beef and the onions, the second fire is burning down. This is what you want – a fire on the bottom and on the top for even cooking. In just under 2 hours the dish was finished. And the guests had arrived. Left to right, clockwise, it’s Rich, Andres, Karen (hidden behind Andres), Su (Hui-chen’s high school friend), Hui-chen, Becky (at the far right edge) and Jerry. 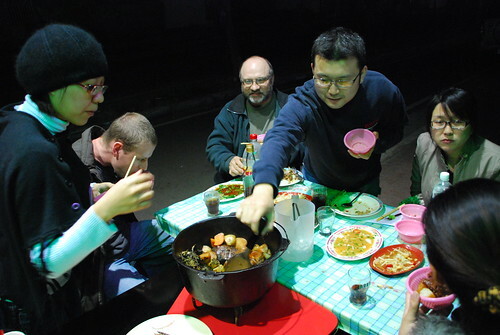 Hui-chen is dishing out the beef from the Dutch oven. You can see that we already have a load of Thai food on the table. 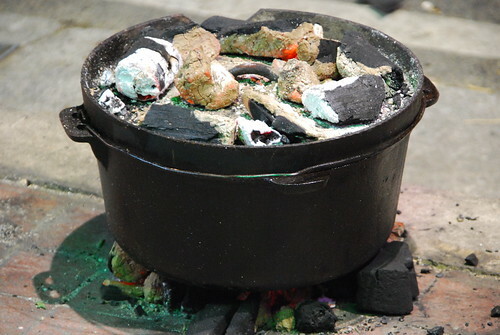 This is a closeup of the Dutch oven dish. The basil darkened from being baked by the top coals, and you can see that the vegetables have a baked look to them too. The beef turned out butter soft. You could cut it with chopsticks. Even though we sat outside it was not cold. The weather was perfect for us, even though the day before it was a bit cold. I have one more shot for you. This is “tom yum” Thai style hot and sour soup. It was delicious! Once again Shao-hui did not disappoint! Looks delicious! I wish I could have made it down but I had to show a handful of aunts around Taipei. Todd » next time, bring ’em down! Believe me I tried! When picking where to go out to eat I said, “I know a great Thai place in Hukou!” Unfortunately, that didn’t go over very well. Todd » well now you can show them what the food looks like! that should change their minds! MJ great looking food as usual. The stew looks a real winner. I will have to search for a Dutch over here in Isaan Thailand. I am sure there will be one hidden somewhere. 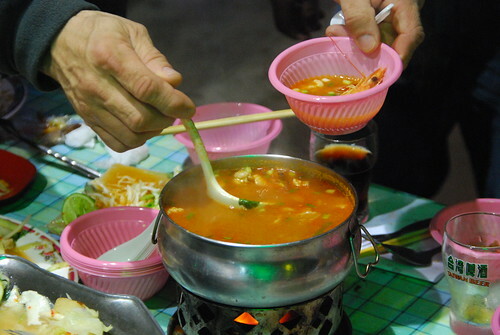 Tom Yum will keep you warm if it is cold, a great tasting soup. I am happy it wasn’t cold as most people looked to be really rugged up as it was. I didn’t see any metion of alcohol. In the pictures I saw a bottle of cake and in one picture I can see a partial obscured bottle of what could have been Thai rum but not sure. Brunty’s last blog post..Thailand. A gift from home makes me a happy Australian. Brunty » we did have one bottle of Sang Som but we’ve all cut down on our drinking of late. 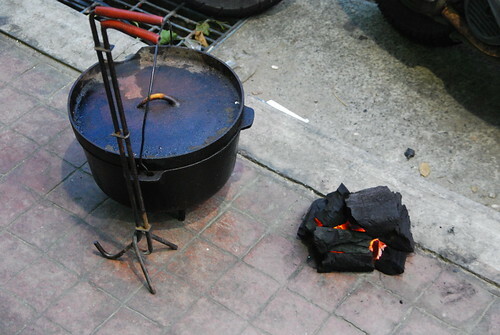 i haven’t seen a Dutch oven in Thailand but i’m sure that somewhere, a camping store in Bangkok would have one. take care Brunty, and i’m looking forward to your next outing :). as always mj, thanks for the hospitality. it was great times and great food as usual. yeah, that tom yum was the higlight of the night for me… just excellent! can’t wait to go back again… which will be soon! andres » you, your family and friends are always welcome Andres! take care. 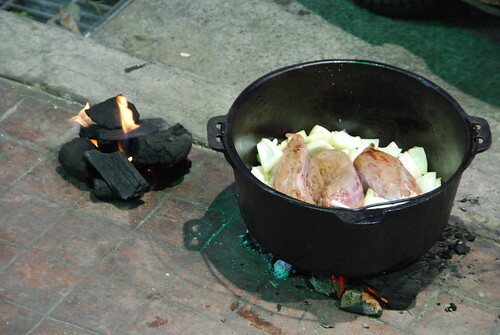 I have never seen one cooking on a dutch oven. You don’t have to worry about burning the food. Great method. Where to get the oven? Can I put it in my fire place to cook? Your food looks appetizing. You have great food here. My sister-in-law cooks great tomyam and thai dishes. We should have a party together with you guys. Sigh, it’s too late now. They are no longer living in Taiwan. 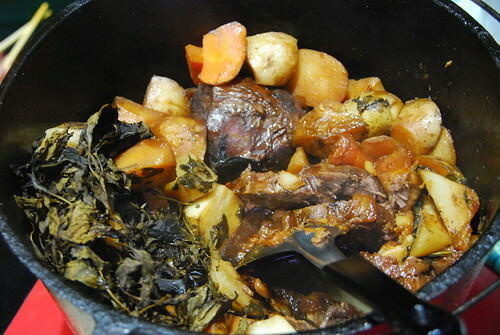 jesie » the Dutch oven is pretty much “dump the food in and forget it.” you do have to watch to make sure that you have enough liquid or if you are baking, that the temperature is where you need it to be. but you don’t have to stir the food generally. i have 3 of them in Taiwan and i brought these from the US, but i’ve seen some flat-bottomed models from Canada in some of the camping stores in Hsinchu. apparently they are around if you need to find them. thanks for your comments. oh! i forgot to mention that sure, you absolutely can use your Dutch oven in the fireplace! just check out virtually any old Western movie that shows the inside of the house and you’ll see a “crane” mounted in the wall of the fireplace for hanging Dutch ovens!